This is an example of a crystal with two common names for the same configuration. 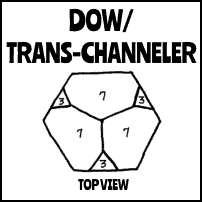 Called both Dow (named after Janeann Dow) as well as Trans-Channeler (because these crystals are both Channelers and Transmitters in configuration). They are more commonly referred to as Dow. 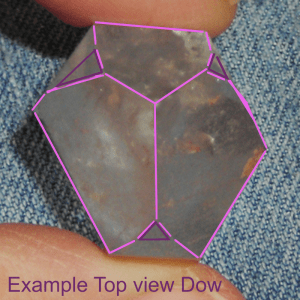 Dow crystals have three seven-sided faces with a triangular face between each of them. So sides of the six faces will look like seven-three-seven-three-seven-three. 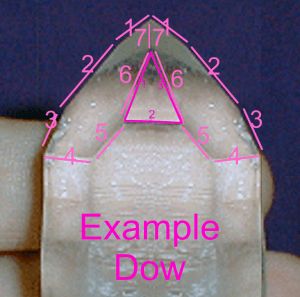 A textbook perfect Dow or Trans-Channeler will have symmetrically-sized faces and a centrally located point. Some will be uneven in symmetry, but the count will be correct. Dow or Trans-Channelers combine the qualities of the Transmitter and Channeler crystal and provide a connection with the self and Universal Truth. 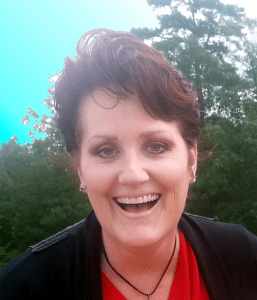 Dow crystal energy is sharp, clean and direct. Self Healed Arkansas quartz crystal Dow point, water clear (Masculine), Devic Temple (Fairy Frost, Mirror Fractures, Rainbows), a Bridge crystal, an Inner Child, Lineated Sides, Barnacles, a Key and Lineated Faces. Packaged with a business-card-sized printed description. Crystal sizes vary, depending on the configuration and are hand-selected for you at the time of your order. I have temporarily increased the price of these Dow crystals because the ones I have right now are AAA Grade (very water clear) and about thumb-sized. Image = example of TYPE crystal described.